It's not OK You think sexual harassment and assaults are at their worst in the movie industry? Hazards editor Rory O’Neill says try life as a cleaner, hotel housekeeper or waitress – or anyone in low paid ‘women’s work’ facing routine abuse with few rights and little chance of redress. Hit list The TUC says reporting of work-related violence is critical in tackling the issue. The union body advises that without a strong and well-used reporting system, there will not be an effective response to incidents or a way to identify potential hotspots and trends. Here, it lays out its blow-by-blow guide. Prison officers’ union POA has said the return of a crisis-hit Birmingham prison to the public sector is a ‘major success’ for the union. HMP Birmingham is being brought back into government control permanently after G4S saw its contract terminated. Prisons minister Rory Stewart confirmed G4S will pay the government a £9.9 million settlement to cover the additional cost to the Ministry of Justice of its ‘step-in action’. UNISON has hit out at a government proposal that could see education and NHS staff required to prevent and tackle serious violence. The public service union it says the move could place an additional burden on already ‘overwhelmed’ and ‘overworked’ staff. The Scottish teaching union, EIS, have issued the results of a poll that found that hundreds of East Ayrshire teachers have seen, or experienced, physical assaults in school. Out of 505 teachers surveyed, ninety-five per cent of those surveyed had experienced or witnessed a violent incident in school; almost a third of teachers polled also said that violent incidents take place one to three times each week. Security staff at Southampton General Hospital have served notice of their intention to strike for eight days in their dispute over pay rates, sick pay and safety concerns. Unite said that neither the employer Mitie Security Ltd nor the bosses at the University Hospital Southampton NHS Foundation Trust had made any effort to resolve the dispute over the lack of adequate personal protective equipment (PPE), such as stab vests and safety restraints. Coventry Council must commit to a full, independent investigation into a bullying ‘epidemic’ raging through the town hall, the union GMB has said. The union raised its concerns at a council meeting after a GMB survey revealed 85 per cent of the local authority’s workers had experienced bullying. New statistics from the retail union Usdaw show that the key triggers for violence, threats and abuse against shopworkers are theft from shops and enforcing the law on the sale of alcohol and other age-restricted products. The union found that during 2018 nearly two-thirds of shopworkers experienced verbal abuse and over 40 per cent were threatened by a customer. A special needs teaching assistant from Plymouth who was assaulted after being threatened repeatedly by a student had raised her concerns earlier but management ‘turned a blind eye’. UNISON member Andrea McGowan, who taught students with autistic spectrum conditions, suffered a back and neck injury after being put in a headlock by a student she had reprimanded for bad behaviour. In a landmark case, the US Occupational Safety and Health Review Commission (OSHRC) has ruled a social service employer is accountable for failing to protect workers from workplace violence. Integra Health Management was cited for safety violations following the death of an employee who was stabbed nine times, then left bleeding on a front lawn after a December 2012 home visit to an agency client with a history of mental illness and violent criminal behaviour. One in five station-based Tube workers have been physically assaulted, according to research by the union RMT. RMT is calling for action including increased staffing to tackle this “growing tide of violence” against staff. Lone working can be dangerous and employers need to take precautions to protect any employee working alone, the union UNISON has said. Two-thirds (66 per cent) of isolated workers report they have experienced violence and aggression from the public, the public service union’s biennial health and safety seminar heard. Waste workers in a London local authority should benefit from a new ‘respect and protect’ scheme, their union has said. GMB, which represents refuse, street cleansing and recycling employees employed by Serco under a Hammersmith & Fulham council waste management contract, is backing the company's Citizens Charter and Respect and Protect Campaign. Security staff at Southampton General Hospital are regularly attacked in the accident and emergency (A&E) department and are not receiving even the basic protection they require, their union Unite has said. Unite said its members, employed by Mitie Security Ltd, report that the firm has refused to provide adequate personal protection equipment (PPE), such as stab vests and safety restraints, even though knife-related incidents are increasing. ‘Abhorrent’ threats by right-wing activists targeting newspaper, freelance and broadcast journalists have prompted the journalists’ union NUJ to renew its demand that the authorities take action against the perpetrators. The union said individuals who seek to intimidate and silence the media by publishing photos, names or addresses of journalists and who urge their supporters to target journalists should not be allowed to do so, arguing this behaviour is unlawful harassment and intimidation. The TUC has repeated its warning that bullying is a health and safety issue that must be taking seriously at work. TUC guidance includes a simple survey form, “intended to cover both workplaces where there is no existing policy, as well as those where there is a policy – after all it is important to know that if there is a policy, it is working,” noted TUC head of safety Hugh Robertson. Staff and interns in parliament are “woefully unprotected” if they are sexually harassed at work due to “glaring gaps” in legislation, according to Fawcett Society research. Its report concluded parliament is effectively “above the law” on harassment because of these gaps in the legislation. A bar manager who was choked by a chef at their work Christmas party has been awarded more than £6,600 compensation from the firm. Molly Phillips passed out after Nathan Webb gripped her at the Cameo Club in Cardiff on 1 January 2018, in an incident caught on CCTV. Warm words and sympathy will not protect shopworkers from violence, threats and abuse, retail union Usdaw has said. The shopworkers’ leader Paddy Lillis was commenting after a protection of shopworkers amendment to the Offensive Weapons Bill was not accepted at a report stage debate on the Bill in the House of Lords. Witnesses have been urged to come forward after a Tube driver was assaulted on London’s Jubilee line. The British Transport Police BTP) has released pictures and CCTV footage of the 29 January incident, where the Tube driver was attacked with a bottle on board on a train at Kilburn station. The prison union Community is calling on the government to end ‘the cycle of violence’ in prisons. The comments from the union, which represents workers in the privatised justice and custodial sector, came in the wake of the latest Ministry of Justice ‘Safety in Custody’ report which revealed there were 10,085 assaults on prison staff in the twelve months to September 2018, a 29 per cent increase on the previous twelve months. The government must act to protect shopworkers in the face of a sharp increase in thefts from supermarkets, retail union Usdaw has said. The union was speaking out after Press Association statistics obtained from police forces in England and Wales revealed a 7 per cent increase in thefts from supermarkets over the last four years. Usdaw news release and news release on the Offensive Weapons Bill’s progress. Offensive Weapons Bill Grand Committee (1st Day) - 28 January 2019. Liverpool has become the first council in the country to make UNISON’s ‘End violence at work charter’ part of its commissioning process for third-sector care and housing providers. “Taking this step will help reduce the number of violent incidents staff are subjected to and will show all service providers we deal with that violence against staff is not something to be swept under the carpet,” UNISON’s Gavin Edwards told councillors. Shopworkers’ trade union leader Paddy Lillis has welcomed as a step in the right direction a Home Office minister’s offer of limited measures to address violence, threats and abuse against shopworkers, but has expressed dismay after another minister later said the government did not accept the union’s case for changes to the Offensive Weapons Bill to protect workers. Kent prison officer James Grant, who suffered burns and psychological trauma after a prisoner threw boiling sugar water at his face has secured £7,000 compensation with the help of his union POA. The mixture of boiling water and sugar, often referred to by prisoners as ‘napalm’, sticks to the skin and intensifies the burn. Shopworkers’ union Usdaw has welcomed cross-party support for the protection of shopworkers during the second reading of the Offensive Weapons Bill in the House of Lords. Usdaw is calling on the government to provide greater protection for the shopworkers who will enforce the new law at the point of sale of knives and corrosive chemicals, a call backed by peers on 7 January. A round-table discussion between the Home Office, retailers and the union Usdaw on how to protect staff from violence, threats and abuse was ‘positive’, the retail union’s leader Paddy Lillis has said. Home Office minister Victoria Atkins agreed to the 11 December talks last month during the report stage of the Offensive Weapons Bill. Rail union RMT has warned of a growing threat from violence on Britain’s railways as a result of understaffing on the network. The union says staff numbers have been ‘hacked to the bone’, which could lead to major problems coping with demands over the festive season. Some 61 per cent of women and 35 per cent of men say they have experiencing sexual harassment at work, according to a survey conducted by Australia’s top union body. Preliminary findings of the ACTU survey on workplace harassment, which has so far received over 7,500 responses, reveal the widespread nature of sexual harassment in the workplace as unions lobby for the Fair Work Commission to be given powers over workplace disputes including harassment. A new bill to be introduced in a Canadian province is designed to offer better protection from bullying in the workplace. Prince Edward Island’s (PEI) Eric Donovan Bill is in memory of a man whose death was linked to harassment on the job. Retail trade union Usdaw has called on the government to increase funding and resources for the police to help them tackle a rising tide of attacks on shopworkers and theft from shops. The union was speaking out during its annual Respect for Shopworkers Week, 12-18 November. Education workers are urging local schools and councils to add their weight to a union charter aimed at ending violence against school staff by pupils. Between January 2017 and November 2018 1,594 physical assaults were carried out by pupils against school support staff across 13 local education authorities (LEAs), a Freedom of Information request by the GMB union has revealed. NASUWT news release. BBC News Online. The head of animal welfare charity RCPCA has promised action to address high levels of bullying and harassment in the organisation. New chief executive Chris Sherwood pledged to tackle his organisation’s toxic culture, revealed in a major survey undertaken by Unite. The use of bodycams by frontline workers on Virgin Trains has resulted in assaults on staff falling by more than half, in what the union RMT has described as a campaign ‘victory’. Following a pilot scheme, Virgin Trains said assaults on Virgin Trains staff have fallen month by month, from 20 in March 2018 to 6 in September. The government must act in light of new Office for National Statistics (OHS) figures revealing a further increase in shoplifting in England and Wales in the year to June 2018. The union says these police-recorded reports confirm an upward trend that has seen a 32 per cent increase over the last decade. Public services union UNISON has called for action from the Scottish government to “end the aggro” faced by council and NHS workers. The union’s 2018 survey of violence at work revealed assaults on public service workers are running at more than 40,000 incidents for the third successive year. Union members working in the Houses of Parliament may have “little other choice” but to resort to action unless there is a tough response to the widespread bullying and sexual harassment revealed by a just-published probe, the union representing senior civil servants has warned. Amy Leversidge, assistant general secretary of the FDA, which represents top civil servants, said staff had been “pushed to breaking point” and Prospect deputy general secretary Garry Graham has written to the leaders of all parties at Westminster, stressing the need for effective leadership to put the wellbeing of staff ahead of political interests or personal agendas. Prison officers across the country will be equipped with incapacitant spray to help keep them safe and maintain order, prisons minister Rory Stewart has announced. The news, which has been welcomed by the prison officers’ union POA, “will ensure every prison officer in the adult male estate is equipped with PAVA - a synthetic pepper spray which temporarily incapacitates those it is sprayed upon,” the government said. A newly published independent report into parliamentary bullying and harassment should be ‘the final nail in the coffin’ of the culture of abuse of parliamentary staff by MPs, the union Prospect has said. The report from Dame Laura Cox found a culture of “deference, subservience, acquiescence and silence” in Westminster where abuse was “tolerated and covered up”. Two-thirds (65 per cent) of airline cabin crew have experienced sexual harassment, with one in five crew reporting more than 10 incidents, a union survey has found. The findings “show that airlines are not taking the problem seriously and are not supporting workers when they are faced with what are daily assaults on them,” said TWU national secretary Michael Kaine. TWU news release. Skift. Risks 870. 13 October 2018. New research from the rail union RMT has revealed the vital role train guards play in delivering a safe, secure and accessible railway. The union says the crucial safety critical role of guards is demonstrated by the fact that 80 per cent of guards have prevented an emergency situation and used their safety critical training in an actual emergency situation. RMT news release. Risks 870. 13 October 2018. Rail union RMT has called for an immediate halt to plans to axe train guards and ‘de-staff’ stations after new official figures from the British Transport Police (BTP) revealed a sharp 17 per cent increase in violent incidents on Britain's railways. RMT general secretary Mick Cash said the “shocking figures” demonstrate “nothing short of criminal negligence on the part of those rail companies that have axed guards and de-staffed stations‎ in the drive for profits." RMT news release. BTP news release. Risks 870. 13 October 2018. CWU news release and joint statement. Risks 870. 13 October 2018. Cooperative Party news release. 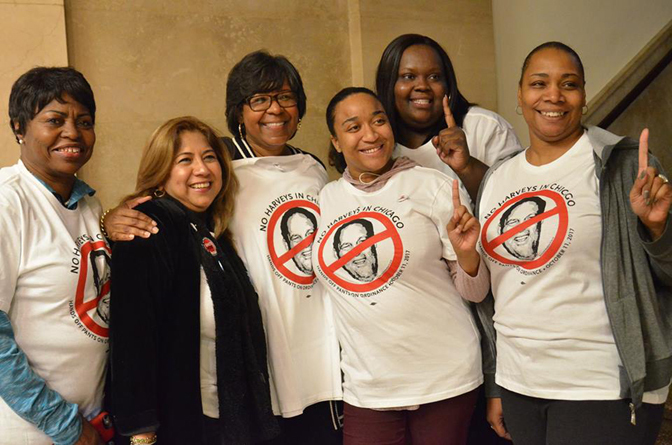 Usdaw news release and Freedom from Fear campaign. Risks 870. 13 October 2018. Crime levels on Northern rail services are climbing because ‘greedy’ operators are putting profits before passengers by shedding staff, rail union RMT has said. The union said the problem will worsen if the company succeeds in removing safety-critical guards from trains. The disturbances at Long Lartin prison are a further illustration of the crisis engulfing Britain’s prison system, the prison officers’ union POA has said. In the wake of a weekend of riots at the prison, the union said its call for protective measures to help staff quell the ‘unprecedented levels of violence’ had been vindicated. Progress this year towards an International Labour Organisation (ILO) convention on harassment and violence in the workplace has focused attention in Japan on an issue often ignored or downplayed in the country. On 19 September, the Japanese Ministry of Health, Labour and Welfare's Labour Policy Council began serious talks on the subject. The government has said that it will crack down on NHS directors who fail to act on what ministers say are “alarming” levels of bullying of hospital staff. Stephen Barclay, a health minister, has told The Independent he wants the current “fit and proper” person test for NHS directors to be widened to require action on harassment and discrimination. The prison officer’s union, the POA, has taken protest action over the huge rise in violence in Britain’s prisons. It was triggered by a letter from Chief Inspector of Prisons Peter Clarke to the Secretary of State issuing an Urgent Notification Notice at HMP Bedford following a catalogue of failures. Shopworkers’ trade union Usdaw, has welcomed an amendment to the Offensive Weapons Bill that will make it a specific offence to obstruct a shopworker in their duty to enforce the law on the sale of offensive weapons. Shopworkers face growing violence and intimidation when they refuse to sell prohibited items such as acid and knives to those considered underage. Unions have welcomed a new law that will make it a criminal offence to assault emergency workers including police, paramedics, firefighters, prison officers, search and rescue personnel and custody officers. The current six-month maximum sentence for common assault will be doubled to a year for the new crime created by the Assaults on Emergency Workers (Offences) Act, which will also enable judges to increase terms given to people committed for a range of other crimes where the involvement of emergency services was an “aggravating factor”. Half of school support staff have experienced ‘shocking’ violence at work, with incidents including stabbings and attempted strangulations, a study by the union GMB has found. More than half of school staff had first-hand experience of violence at work – with more than 16 per cent suffering attacks every week, the new GMB figures show. There must be justice for the victims of the Grenfell fire and those harmed by workplace sexual harassment, unions have said. Delegates to the TUC Congress, held from 9-12 September in Manchester, called for politicians to be held to account over the decisions that led to 72 people dying in the Grenfell Tower blaze last year and endorsed a motion calling for changes in the law to empower victims. Civil service unions in Scotland have said all workers must be safe from harassment at work. Unions PCS, Prospect and the FDA provided the statement to members employed by Scottish ministers, Scottish public bodies and in the Scottish parliament in the wake of media coverage of harassment allegations by two civil servants against former first minister Alex Salmond. Prison unions have said the decision by the government to take over running of Birmingham Prison from private company G4S ilustrates how a combination of privatisation and underfunding has put the safety of inmates and prison staff at risk. The decision to remove the prison from G4S’ control came after the chief inspector of prisons Peter Clarke described it as the worst prison he had ever been to. Police chiefs have pledged to act over high levels of sexual harassment among police staff identified in a report by UNISON, the London School of Economics and Political Science (LSE) and the University of Surrey. The National Police Chiefs’ Council (NPCC) said the report highlights some ‘outdated and unacceptable behaviour’. Retail union Usdaw has said it is ‘extremely concerned’ by news some police forces are advising shopworkers to detain shoplifters by using a citizen’s arrest. The union said the ‘worrying’ idea is neither safe nor practical. Shopworkers’ trade union Usdaw has given evidence to the parliamentary public bill committee scrutinising the Offensive Weapons Bill. The union is calling for amendments to the Bill that will make it an offence to attempt to purchase corrosive substances and knives underage or to intimidate or assault a worker enforcing the law on age restricted sales. New figures showing that Scotland’s mental health workers face a rising tide of assaults are “just the tip of the iceberg,” a union has warned. There were 8,519 incidents resulting in injury in the country’s mental health facilities in 2017/18 – equating to almost one an hour. Joint research by the Musicians’ Union (MU), Equity and the Incorporated Society of Musicians (ISM) has revealed one in two music, dance and drama students are at risk from bullying and discrimination, including sexual harassment. Out of the 600 students who responded to the survey, just over half said they had experienced some sort of incident in the course of their study, with over 50 per cent of those affected choosing not to report their concerns. Unions representing journalists, parliamentary staff and civil servants have welcomed a new code of behaviour for parliament prepared by a cross-party working group. The group, which proposes the creation of a new independent complaints and grievance procedure, was set up in November 2017 to create a grievance process. Barclays is under pressure to provide quick compensation to 126 former employees who say they were sexually assaulted by a doctor hired by the bank. The bank lost a legal bid to escape liability for the claims in the Court of Appeal. The number of prison officers resigning from their jobs has more than doubled in the last two years amid soaring levels of violence and self-harm in UK jails. Ministers have been accused of driving a crisis in prisons after an analysis of official figures revealed one in 16 officers resigned last year, compared with one in 33 officers two years before and just one in 100 in 2009/10. Sexual harassment at work is a trade union issue – that’s the strong message in a new ‘Workplace guide to dealing with sexual harassment’ produced by the linked unions BECTU and Prospect. “The message to employers is clear: cultivating a respectful workplace is the single most valuable protection against sexual harassment and other unwanted behaviours,” Prospect and BECTU note. Paramedics in Wales could soon wear body cameras after a spike in ambulance staff being attacked. Paramedic Nathan Holman, the GMB branch secretary for the Welsh Ambulance Service, said the move would help to improve safety and increase prosecutions. Labour will clamp down on the ‘scourge’ of sexual harassment at work and make it easier for victims of discrimination to take their companies to an employment tribunal. Labour leader Jeremy Corbyn said the party would ban the use of non-disclosure agreements to silence victims of sexual assault. A third of women have experienced workplace sexual harassment, a survey conducted by the union Prospect has found. The ‘disturbing’ findings indicate many forms of sexual harassment are still prevalent across the UK workforce, the union said. An ambulance technician who suffered a harrowing sexual assault before using her experience to campaign successfully to improve the law has been given a special award. Sarah Kelly, who works for the Yorkshire Ambulance Service (YAS), was handed the Eleanor Marx special award at GMB’s annual congress in Brighton. Disturbing new figures from the union GMB show more than one in ten school support staff who responded to a survey have experienced sexually inappropriate behaviour from pupils. GMB said the ‘shocking’ statistics come from its nationwide survey of members, which found the abuse was leaving some staff intimidated and ‘mentally scarred’. GMB news release. Risks 852. 9 June 2018. Pupils and school staff in Scottish schools are being put at risk as a result of the failure of some schools to act on information about violent and disruptive pupils, teaching union NASUWT has said. The union is concerned that schools are ‘failing in their duty to record and address all incidents of serious pupil violence and disruption’. Unknown gunmen killed Ahmad Shah, a journalist with BBC Afghan service, on 30 April, making it the deadliest for media in the country as nine other journalists were killed earlier in the day in a suicide attack in Kabul. The International Federation of Journalists (IFJ) joined the Afghanistan Independent Journalists Association (AIJA) in strongly condemning the targeted killing of Shah and demanded swift action from the authorities to arrest and punish the killers. The union GMB is celebrating a double victory after the 'protect the protectors' Bill won cross-party support from MPs last week – with new measures to punish sexual attacks on emergency workers added to the draft law. The union-backed Assaults on Emergency Workers (Offences) Bill introduces a new offence of common assault against an emergency worker and requires courts to treat attacks on emergency workers as an aggravating factor when sentencing. A UNISON campaign to tackle violence against workers in the voluntary sector is attracting wide support. The union’s community service group says 18 organisations have now signed up to the UNISON violence at work charter. UNISON news release. NHS Employers news release. Evening Standard. Shopworkers’ trade union Usdaw and businesses are supporting a new law to protect workers in Scotland. Labour MSP Daniel Johnson is promoting a Bill that would create new offences regarding assaults on shopworkers and others, like bar and pub staff, who are involved in the sale and supply of age-restricted good and services. A sharp rise in convenience shop crime had spurred a renewed union call for action. The call from retail union Usdaw came after latest Association of Convenience Stores (ACS) figures revealed nearly a million thefts from UK convenience stores in 2017, a 65 per cent increase on the previous year. Equity is demanding a safe working environment for its members. The actors’ union says they must not have to endure or observe sexual harassment, adding that perpetrators must understand there is nowhere to hide. The threat of violence against prison officers could lead to industrial action unless they ‘are given the tools to keep them safe’, their union POA has said. The union was speaking out after what it described as “another weekend of chaos and assaults in prisons”. The number of serious injuries suffered by education staff in attacks has shot up by 24 per cent compared to five years ago, the union GMB has said. GMB national officer Karen Leonard said: “Throughout 2018 we will be asking schools to sign up to GMB’s code of conduct to ensure attacks on members, when they happen, are dealt with properly." Retail union Usdaw has questioned whether police cuts are contributing to an increasing in crimes, including shoplifting. The union’s general secretary John Hannett was commenting after the Office for National Statistics revealed a 10 per cent increase in incidents of shoplifting recorded by the police in the year to September 2017. Teaching assistances are facing daily verbal and physical abuse from pupils, GMB has said. The union, which represents more than a third of support staff, told the BBC Radio 5 Live programme it wants schools to adopt a code of conduct on handling pupil violence against staff. Staff at Wrexham's £250m super-prison have claimed it is unsafe, less than 12 months after it opened. The Prison Officers Association (POA) told BBC Wales a “culture of fear” existed among staff at HMP Berwyn. A member of the Scottish parliament has launched a consultation on his plan for a new law to protect shop and bar workers from violence. Labour MSP Daniel Johnson is seeking views on a member’s bill to create new offences around the assault and abuse of workers who sell age-restricted items such as alcohol and cigarettes. Research by the BBC has found almost a quarter of staffers working for MPs have been bullied at Westminster, with 1-in-7 of all those responding saying they had suffered at the hands of the MP for whom they worked. The findings came in responses to a questionnaire sent by BBC 5 live to all staff publicly listed as working for MPs in parliament. Attacks on emergency service workers in Scotland have reached a three-year high, according to new official figures. A total of 6,509 common assaults were recorded on police, fire and ambulance workers across Scotland in 2016/17, equivalent to more than 17 per day. A 21 December 2017 statement by leader of the Commons Andrea Leadsom on progress by the working group on bullying and harassment in parliament reveals not enough progress has been made, unions have said. The statement commits parliament to a new independent complaints and grievance procedure. A local authority has been fined after two of its social workers were assaulted on a home visit by the mother of a vulnerable child. Westminster Magistrates’ Court heard how, on 3 July 2015, two social workers employed by the London Borough of Brent visited the home of a vulnerable child to carry out a child safety plan assessment. Trade unions have reiterated their call for a strong International Labour Organisation (ILO) Convention to tackle gender-based violence at work. Next year’s ILO Conference in June will discuss the development of international labour standards on violence against women and men at work. The use of body cameras is not the right response to a sharp increase in attacks on firefighters, their union FBU has said. The union was commenting after new Home Office figures revealed an 18.6 per cent increase in attacks on firefighters. Shopworkers are calling on the government to introduce an additional penalty for those who assault workers in the course of their duties. The union is also urging members to ‘report it to sort it’ after its survey found that 56 per cent of shopworkers who experienced violence, threats or abuse at work did not report the incident to their employer, and over a fifth (22 per cent) of those physically attacked did not report the assault. Canada’s unions have welcomed a proposed law to address harassment and violence at work. The Canadian federal government said the ‘three pillars’ of the proposed legislation, which would cover federally-regulated staff, are prevention, responding to incidents and providing support to those affected. New statistics have revealed a ‘shocking’ jump in incidents of violence, threats and abuse against shopworkers. Retail union Usdaw launched its interim survey findings to mark its annual Respect for Shopworkers Week. Transport for London (TfL) has swept concerns about the health and welfare of bus drivers under the carpet, Unite has said. The union was commenting on the publication of TfL’s official response to a London Assembly report, ‘Driven to Distraction’. A night Tube driver was attacked after returning his train to the depot sidings in the early hours after duty. Finn Brennan, district organiser for the rail union ASLEF, called for greater security at depots where trains are left overnight, saying the latest incident follows others on the Victoria line. An ambulance service is challenging an ‘extremely lenient’ sentence given to a man who attacked two paramedics. Amy Holtom, a paramedic with West Midlands Ambulance Service (WMAS), suffered a broken wrist while treating a man in Birmingham city centre. London’s bus drivers face shocking levels of abuse, spitting and physical assaults as they go about their job, a Unite survey has revealed. The union announced the survey findings as it launched a new London-wide campaign against assaults on the capital’s 25,000 bus drivers. A bill to double the maximum sentence for common assaults on on-duty emergency workers to one year has successfully started its progress through parliament. Labour MP Chris Bryant’s Assault on Emergency Workers (Offences) Bill received cross-party support during a 20 October debate, passing its second reading unopposed. Unite has renewed its call for better protection of bus drivers after Youtube footage emerged of a driver being attacked with a firework. In the attack on a London bus, a group of youths fired a firework into the bus which hit the driver’s cab before ricocheting around the bus. The Scottish government and all public service employers should take action immediately in order to tackle the “massive scale of the problem of violence against public sector workers”, UNISON Scotland has said. The call came as the public service union’s annual violence at work survey revealed a further increase in reported assaults on public service workers. Shopworkers’ trade union leader John Hannett has questioned whether police cuts are having an effect on crime. He posed the question after latest figures from the Office for National Statistics revealed an 11 per cent increase in shoplifting, continuing an upward trend from 2012. Attacks on emergency workers will result in tougher sentences under a new law that has been given government backing. Chris Bryant's private member's bill would double the maximum sentence for common assault against an emergency worker to a year. Almost half the staff (47 per cent) working for charities and housing associations have experienced violence or aggression, either from people who use their services or from colleagues, according to a UNISON survey In response to the abuse facing its members, UNISON has launched a charter that commits voluntary sector organisations to comply with their duty of care to staff when it comes to violence in the workplace. Reduced funding for mental health services across the UK is leaving staff vulnerable to violence and aggression from patients, and means they cannot provide the level of care needed, the union UNISON has said. The union’s report, ‘Struggling to cope’, found more than two in five (42 per cent) said they had been on the receiving end of violent attacks in the last year. The GMB has made a renewed call for a law to make assaults on emergency workers in the line of duty an aggravated offence. The union, which says there were assaults on 1,000 firefighters, 2,400 paramedics and over 2.4 million police officers last year, is urging MPs to support Chris Bryant’s Assault on Emergency Staff Bill. More than a third (37 per cent) of black or minority ethnic (BME) workers have been bullied, abused or singled out at work, according to research published by the TUC. The polling is part of a major new TUC report on racism at work. An airline industry code of conduct on disruptive passengers is failing to stem the tide of drunken and anti-social behaviour at UK airports and on flights from the UK, according to the union Unite. Its survey of over 4,000 cabin crew working for British-based airlines found that 87 per cent of respondents had witnessed drunken passenger behaviour at UK airports or on flights from UK airports. The Scottish government must act now to improve security and staffing levels on some rail routes to help combat rising anti-social behaviour and criminality, the train drivers’ union aSLEF has said. The union has told Scottish transport minister Humza Yousaf its members are ready to refuse to work on high risk services unless something is done. Almost a third of school support staff have been injured in a violent attack at work and many report they are attacked on weekly basis, a survey by the union GMB has found. The union says the ‘disturbing statistics’ from its nationwide survey of members found almost one in five support staff (18 per cent) experience violence on a weekly basis, and nearly a third (30 per cent) have been injured in violent incidents at school. Tube workers at London Bridge station have taken industrial action in a further protest against the sacking of a member of staff and the disciplining of two others. The RMT members working for London Underground (LU) staged the 24-hour strike from 10pm on 7 May in response to LU’s blame-the-worker behaviour after an incident in which a fare-dodger was violent towards staff. Shopworkers’ union Usdaw is calling for higher levels of security in shops, particularly small convenience stores. The union call came after latest figures from the Crime Survey for England and Wales revealed that shoplifting is continuing to rise, increasing by 8 per cent during 2016, contributing to a 21 per cent increase over the last decade. Nearly one-third of teachers report being abused online over the past 12 months, with half of those targeted saying parents, not just pupils, were behind the abuse. A UK-wide survey of over 1,500 teachers conducted by teaching union NASUWT found 31 per cent of teachers reported being abused online over the last year, of which 50 per cent said they had been abused by a parent, with one in five (20 per cent) of the messages posted by parents included explicit threats. The firefighters’ union FBU has condemned a violent attack on two on-duty firefighters who were threatened with an imitation firearm. The union said the ‘deplorable’ incident took place on 10 April in Spalding, as the firefighters tackled a house fire. Tube union RMT has reacted with fury after London Underground (LU) upheld the ‘disgraceful’ sacking of a staff member who intervened to stop a violent fare dodger from assaulting colleagues at London Bridge last autumn. RMT is already balloting station staff across the London Bridge group for industrial after the member was fired and two others were disciplined for stepping in to stop the serious assault on colleagues, including one who was pregnant. A further delay in implementing a Canadian Ministry of Labour ruling is putting the safety of armoured car workers and the general public at risk, the union Unifor has said. “The directives in the original order recognised that the use of two-person, all off crews elevates the danger of armoured car personnel being attacked in public, which also increases the risk to innocent by-standers,” said Mike Armstrong, Unifor’s lead for the armoured car industry. Workers in the community should not fear violence, the union UNISON has said. The union’s community service group conference agreed to launch a ‘Violence at Work Charter’ which would see employers commit themselves to “a series of interventions”. A bus driver who was spat on by an investment banker in a fit of road rage has spoken out after the £90-000-a-year Barclays executive was fined one week’s wages. The incident happened after father-of-three Leon Delahaye, 44, pulled out in front of Alexis Fountzoulas’ black Mini in London’s Piccadilly Circus on 26 June last year, a court heard. The shopworkers’ union Usdaw has called for urgent preventive action after latest figures showed a sharp upturn in violence, threats and abuse against shopworkers. The British Retail Consortium (BRC) figures reveal a 40 per cent increase in incidents of violence and abuse against retail staff. Teachers and school staff in Wales have been the victims of more than 1,500 physical and verbal attacks by pupils every year, new figures have shown. Teaching union NUT Cymru had responses from 17 of Wales' 22 local authorities to freedom of information (FOI) requests. A union call for a new official rule to protect workers from violence is moving forward. The Occupational Safety and Health Administration (OSHA), the USA’s federal safety regulator, told a stakeholder meeting it was accepting the petitions submitted by unions to the Department of Labor last year and would commence rule making on a workplace violence standard to protect workers in health care and social assistance. The sharp increase in the number of violent assaults against health service employees in England – up by over a fifth in the last five years – is completely unacceptable and requires urgent government action, public service union UNISON has said. Latest figures published by NHS Protect show that in 2015/16 there were 70,555 violent incidents involving health workers, compared to the 57,830 reported five years ago - a 22 per cent increase. According to healthcare workers interviewed this year by a Canadian health care union, the health and well-being of the individuals devoted to caring for health seems to be increasingly at risk from angry, frustrated, or out of control patients. Researchers from the Ontario Council of Hospital Unions (OCHU)/Canadian Union of Public Employees (CUPE) note that every one of the 150 registered practical nurses (RPNs) from across Ontario attending a conference on violence this year reported that they have been assaulted at work. The Bullet. Risks 776. 12 November 2016. A set of trailblazing regulations to prevent workplace violence in California’s hospitals and health care facilities have gained unanimous approval from the state’s Occupational Safety and Health Standards Board. The rules were issued under 2014 legislation backed by the union California Nurses Association/National Nurses United (CAN/NNU). Violence against Scotland’s public service workers has doubled in a decade, union research has found. UNISON’s Violence at Work Survey 2016 shows recorded violent assaults have risen from 20,000 to over 40,000 per year over the last decade, the highest level since the annual survey began in 2006. Tube staff are set to vote on strike action after confirming an increase in attacks in the wake of the closure of ticket offices. Rail union TSSA is in a dispute with Transport for London (TfL) as a result of London Underground (LU) ticket office staff being relocated onto station concourses. TSSA news release. London Evening Standard. Risks 773. 22 October 2016. Prison unions are calling for urgent action over alarming new figures they say expose the true scale of the safety crisis in prisons in England and Wales. The unions say latest Ministry of Justice figures released show that prison staff are increasingly the victims of the safety and staffing crisis. Prisoners can now be prosecuted for attacks on prison workers, after a union-backed High Court case. In a landmark victory for the prison officers’ union POA, the court ruled last week that it is important to be able to prosecute prisoners for acts of violence committed against prison officers while serving time in prison, as a way of protecting prison officers and prisoners. Teaching assistants are routinely facing threats and violence from pupils and their parents, according to a new report from the union UNISON. School support staff blame shoddy disciplinary policies, staffing cuts and a lack of training for the abuse. An alarming rise in violent incidents has sparked warnings the prison system is failing prisoners and staff. Figures released by the Ministry of Justice (MoJ) have revealed that violence has increased in the past 12 months and, in some cases, is close to double the rates from 2010, with prisoner on staff assaults up from 3,640 in 2014 to 4,963 in 2015, an increase of 36 per cent. A former prison worker has been awarded £140,000 after a six-year legal battle with the prison service following an injury that ended her career. While working at a London young offender’s institute, the POA member had been restraining a prisoner after a fight had broken out. Shopworkers’ trade union Usdaw has won a top award from the Suzy Lamplugh Trust for its Freedom from Fear campaign, recognising the union’s achievements in improving personal safety. The Trust’s National Personal Safety Awards recognise the work being done across the UK to keep people safe from violence and aggression and highlight best practice in the field. The Irish prime minister Enda Kenny and the media union NUJ have condemned the threats made against a number of journalists in the Republic of Ireland. The threats follow two killings in a gangland feud in Dublin. BBC News Online. Risks 739. 20 February 2016. New sentencing guidelines recommending much higher fines on firms that break health and safety laws should increase the pressure on unsafe employers ‘to clean up their act’, the TUC has said. TUC head of safety Hugh Robertson said to make the system work better, there should also be more resources for the Health and Safety Executive (HSE), to cover the costs of bringing more cases to court. TUC Stronger Unions blog. Risks 739. 20 February 2016. One in eight people has experienced violence at work, according to new research published by the TUC. The poll over of over 1,600 adults carried out by YouGov for the union body, which has launched a new guide, reveals that 12 per cent of people have experienced work-related violence such as being pushed or spat on, punched or stabbed. TUC news release, violence at work guidance and reporting form. Morning Star. 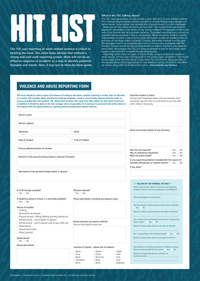 Hit list: TUC violence and abuse reporting form, Hazards magazine. Risks 738. 13 February 2016. UNISON news release. Usdaw news release. Risks 738. 13 February 2016. Retail union Usdaw has called for action to prevent violence, threats and abuse against shopworkers after the British Retail Consortium (BRC) reported a sharp rise in incidents during 2015. Trade body BRC found offences involving abuse or violence against shopworkers were up by 28 per cent. Forty-three per cent of education staff have had to deal with physical violence from a pupil in the last year, according to a survey by the teaching union ATL. The union says of those who have experienced physical violence from a pupil: 77 per cent reported they had been pushed or shoved; 52 per cent had been kicked; 50 per cent had an object such as furniture thrown at them; and 37 per cent had been punched. Workplace violence is widespread and the results are not always easily visible, Hazards provides a violence checklist, guide, resources and news. Have you had success tackling violence at work? Tell the TUC.